That’s right, SIX THOUSAND nail art ideas are at your disposal! Isn’t that incredible? Over 6,000 unique, one of a kind nail art posts are available for your to browse through on Random Nail Art. If you haven’t been over to check out the site, you need to go right now. Now. Have you gone yet? Go! I warn you though, it is highly addicting, as you will find new ideas for manicures you never even dreamed up! Yeah, it’s that good. But seriously, Random Nail Art is a great resource to come up with new nail art ideas, but also to find new bloggers. Over 100 bloggers make up the community, with new blogs added all the time. 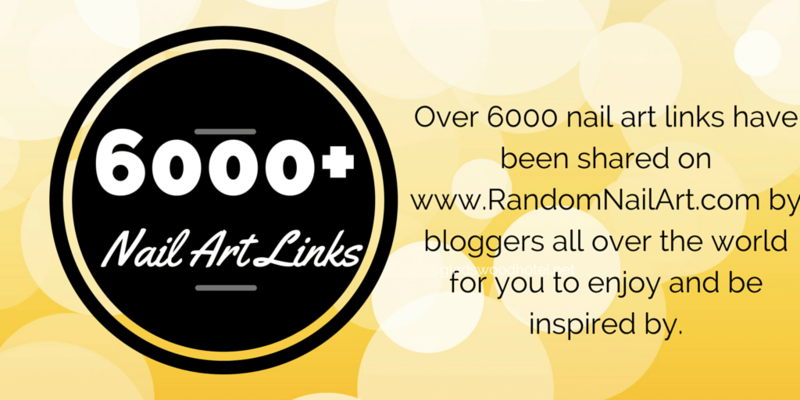 Check out the blogger page to see all of the incredibly talented bloggers that make up Random Nail Art HERE. Random Nail Art is open to bloggers all over the world, so if you’d like to have your blog shared on the site, or know a blogger who SHOULD be on the site, feel free to comment below or email me at sparklysharpfabulous @ gmail.com to get the ball rolling. New bloggers are ALWAYS welcome! That's awesome to hear! Congrats. This is the place for to go for nail inspirations too. Wow! That's a lot of nail art posts! 🙂 I would suggest "Marias nail art and polish blog". She has very pretty floral freehand designs.